Paco received a new copy of King of New York for Christmas and we had a family gaming session this afternoon. I enjoy the game a lot more than King of Tokyo as there are a lot more choices to make in the game. 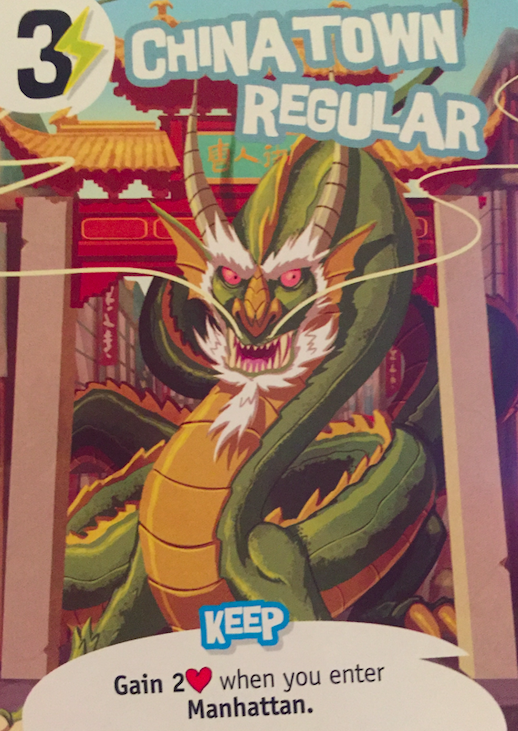 Just to give you a quick, basic rundown of King of Tokyo, each player plays a monster sent to terrorize Tokyo. Whichever monster can accumulate the most fame (20 stars) wins the game. You can also attack other monsters in the game, so if you are the last monster standing, you also win. You do this with a Yahtzee style gameplay, where you roll 6 dice and can reroll them up to 3 times. Each side of the die gives you different options of what you can do in the game. 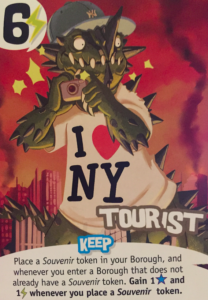 One of the changes that I really like in KoNY is the ability to not just attack other monsters, but instead attack buildings around New York. When you attack a building, you get a small bonus, but you also bring a military unit to your borough to help defend the city against your razing. Another change in this game is that you can be attacked not only by other players, but also the military units defending the city. It is a small change that increases the strategy of the game without changing the heart of it. The game is still a last-monster-standing game or who can become the most famous monster in New York. The art and theme of the game are also great. I found the theme to be even stronger in this game as opposed to its predecessor. 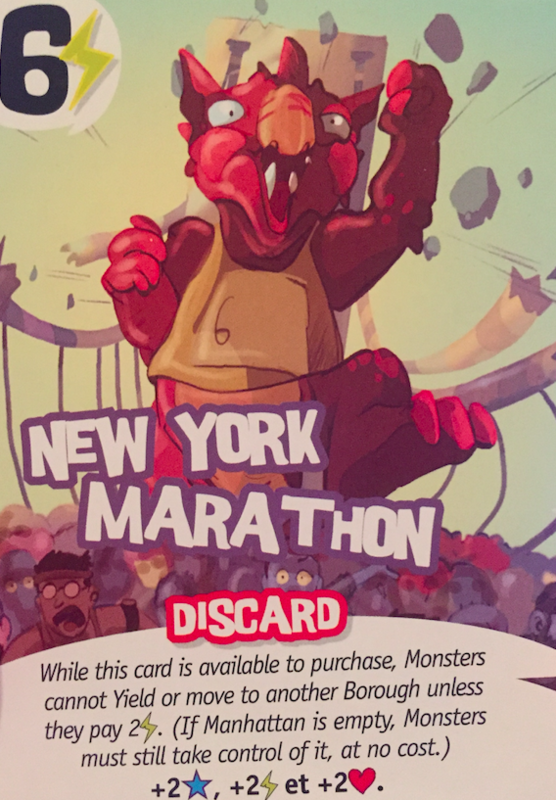 I love that the New York Marathon card doesn’t allow monsters to move unless they “pay”. Much like in real life, you aren’t getting around the city easily if The Marathon is happening. 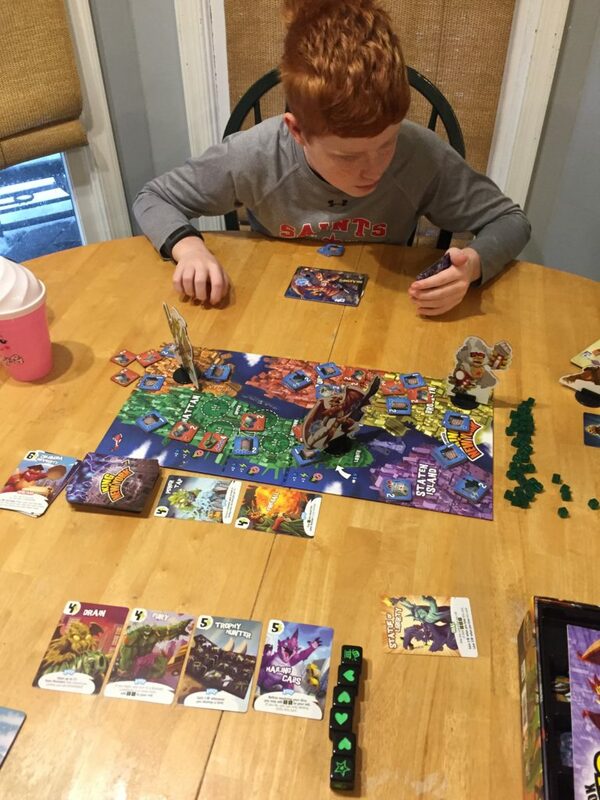 King of Tokyo is a great game to play with kids but feels a bit lucky and mindless. There are definitely decisions to be made, but there is a lot of luck involved. I don’t see myself pulling this one out when I’m with a bunch of friends. 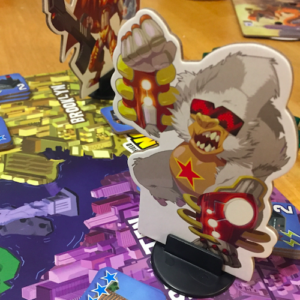 While King of New York still feels a bit sillier than my normal games, I think I’d enjoy having fun with some of my friends with this one. There are plenty of ways to accrue points or knock other players out in KoNY that make it a much better option out of the two. Adding in the King of New York: Power Up! expansion would make this game even that much better. That expansion adds special powers and abilities for each character so that it makes each character play a little bit differently. Our game today ended up with an early exit by Casey (not realizing her health was so low) followed by Paco getting knocked out (waiting a little too long to exit Manhattan). I secured the win by gaining enough fame to be the SuperStar of New York and beating the last monster, Ladybug. I see a rematch happening in the near future.